Part of this article appears in print in the April 2018 issue, as part of the "Favorite Home Shops" feature story. Click here to subscribe. On March 20, it became official: it’s spring in Seattle. That doesn’t mean it won’t continuing raining until Independence Day, but it does mean that the buds are breaking, the trees are slowly waking, and the season of Seattle’s all-star flora game is upon us. One easy way to keep spring alive (even when it’s still gloomy) is sprucing up your home with lush greenery and pretty petals. Here are seven Seattle shops you should check out. This south Seattle neighborhood gem does it all—builds beautiful bouquets, sells adorable stoneware pots, and boasts a large collection of apartment and house-friendly plants. The staff is incredibly knowledgeable and will help you find the right plant for your lifestyle and house (i.e. give you the necessary “please don’t let it die” advice). This shop has withstood the test of time, too. In a city that’s growing exponentially, it’s refreshing to buy your plants from a place that opened in 1907. So. Many. Plants. Both Plant Shop locations (there is also one on Capitol Hill) are filled to the brim with greenery. Whether it’s a cactus, a hanging Blue Star Fern or a Tineke Rubber Plant, the Plant Shop probably has exactly what you’re looking for. As an added bonus, the shop will deliver (for a fee) anywhere in the Central District, First Hill, or Capitol Hill. They also have a small selection of plants available for purchase on their website—for the days when it’s supposedly spring, but it’s still gross out and you simply can’t bear to leave the house. There may be no better Seattle Sunday activity than wandering the stalls of the Ballard Farmers Market. Between the traveling poets, the usual parade of adorable corgis and array of sea-salt caramels lies a laid-back oasis, the Palm Room. Visually, the place is stunning, with hanging plants cascading from the ceiling, tiny succulents decorating the walls, and huge Monsteras and other massive beasts positioned around the room. Peruse the various plants or make your own terrarium adorned with tiny rocks and crystals from the store’s collection of stones. At first, the prices may seems a little high, but the combination of unique plants and staff expertise make it much more reasonable. Miroja is a new addition to the Seattle plant scene—and a welcomed one. The simplistic, classic, impeccably produced vibe of this boutique creates a relaxing place to shop for something you might kill. Beyond the airy space and beautiful plants, what sets Miroja apart from many other shops in the city is its emphasis on education. The staff holds workshops throughout the year—this month included a spring flower crown lesson and seasonal centerpiece classes. They cover topics as simple as terrarium building and as complicated as DIY wedding flowers. So, Seattle Seed Company may not provide the instant gratification you can get from buying a potted plant, but isn’t it equally thrilling to to grow something yourself? This Yesler-located shop sells organic, heirloom and non-GMO seeds and garden supplies. But alsos deal in living, breathing verdure. They have a selection of plant services, including a plant hospital, where you can bring your sick plant; a plant hotel, where you can store your plant while you go on vacation; and plant rentals, if you want nice plants at your next event but don’t trust yourself to grow them. Glasswing is basically a one-stop-shop for the dreamiest PacNW home possible—plants included. The front half of the Melrose shop is a dedicated space for clothing, furniture, plants, and other home goodies. The back half is a shared design office and gallery space (which is available to rent). It’s a store made for perusing, full of household inspiration, like drawers full of mini plants and countless hanging terrariums. Glasswing also hosts workshops. “Houseplants 101,” for example, goes through the do's and don'ts of indoor plants for first time plant owners and plant parents looking to expand their knowledge. The West Seattle Nursery opened 30 years ago—well before houseplants became the newest obsession. This neighborhood small business is a self-proclaimed “eclectic group of horticulturalists and plant enthusiasts working together for the edification, service and common good of gardeners everywhere.” Sounds like just the right people to help you decide which fruit tree to plant in your backyard or tell you what small plant can thrive in the mediocre light of your apartment. 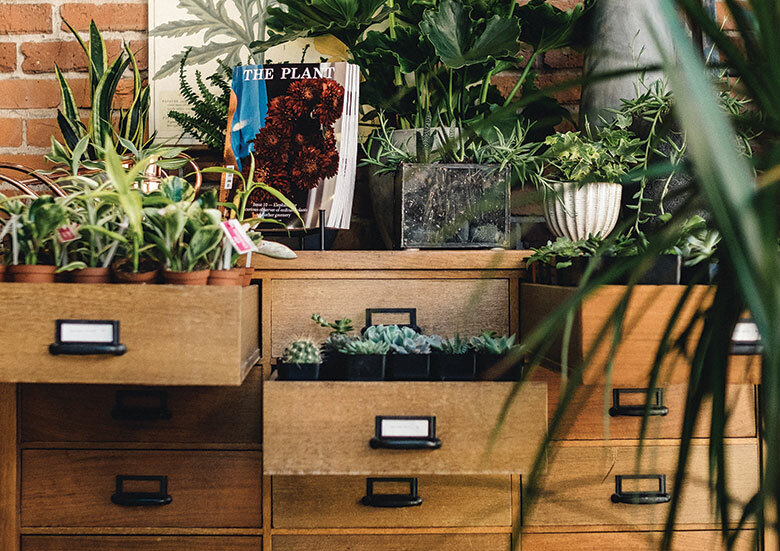 Beyond slinging plants, the West Seattle Nursery also provides a slew of plant-based services, including at-home garden design consulting, a gardening class for kids, plant rentals, and tool sharpening. Chelsea Lin and Nia Martin contributed to this story.